THAILAND, 12th April 2013 – SafeNet held its 2013 ASEAN Partner Summit in Novotel, Phuket Resort Thailand on 11th to 12th April 2013. 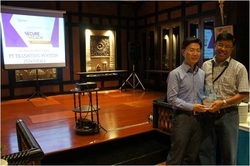 During the partner event, Transition Systems Indonesia was awarded “SafeNet's 2013 Partner Excellence Award” for overachieving sales target in FY2012. Founded in 1983, SafeNet, Inc. is one of the largest information security companies in the world, and is trusted to protect the most sensitive data for market-leading organizations around the globe. SafeNet’s data-centric approach focuses on the protection of high value information throughout its lifecycle, from the data center to the cloud. More than 25,000 customers across commercial enterprises and government agencies trust SafeNet to protect and control access to sensitive data, manage risk, ensure compliance, and secure virtual and cloud environments.